Amaryllis Hotel is located near the beautiful black beach Perissa Santorini, an ideal destination for your vacation in Santorini. 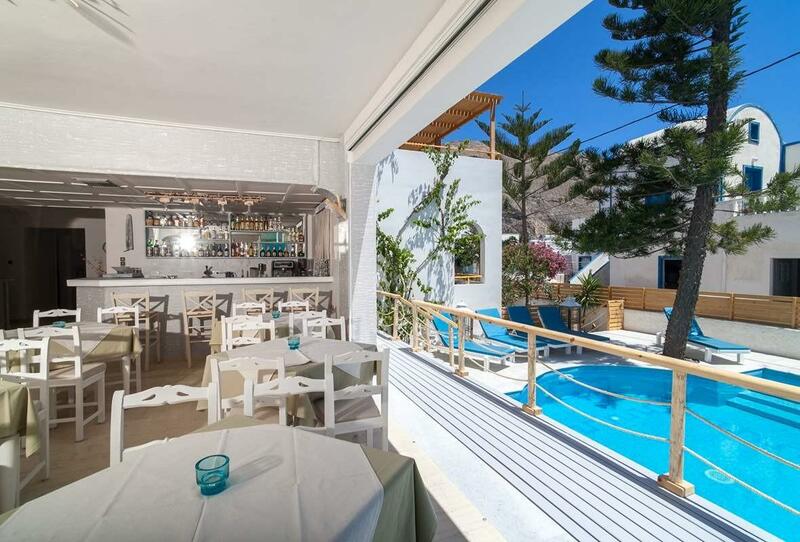 The simple yet central Hotel Amaryllis will provide a great base for those who want to make the most of the sun and sand. Amaryllis has been constructed and organized with special care, so as to guarantee a comfortable staying while you are enjoying your holidays. Amaryllis Hotel is an ideal destination for couples, family vacations with or without children and also for small breaks from the everyday routine. Located on Perissas main road, the hotel is only 150 meters from Perissa beach, a long stretch of striking black volcanic sand offering all sorts of water sports. The resort center is also 50 meters away, where you will find cafes, pubs, discos, restaurants, supermarkets and bus station. The hotel has a pleasant dining room for your breakfast, TV room and a fully equipped bar, also safety boxes. All rooms are equipped with private bathroom, telephone, refrigerator, satellite T.V., hairdryer, air conditioning and balcony.